This meditative pendant is made from carefully stacked sea glass. Imagine, in the middle of a hectic day or a stressful meeting, being able to slip away for a moment to contemplate the quiet beauty of nature. This elegant sea glass necklace lets you carry that moment of peace with you, wherever you go. Jewelry designer Carla Garro assembles bits of sea glass in a soothing palette of oceanic colors. The smooth, organic shapes are both lovely to look at and calming to touch, reminding you that even the chaos of a crashing wave can result in something beautiful. Handmade in New Bedford, Massachusetts. 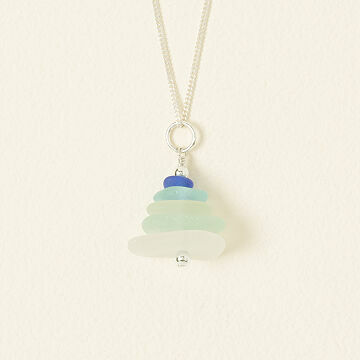 I was first looking at the Seaglass new beginnings necklace, but I like this one better. I used the verse that comes with the new beginnings necklace to tell our daughter in law that we are now with her and our son on their new journey. The quote also talks about how sea glass becomes beautiful through adversity and that suited them well. Beautiful, elegant little reminder of days spent walking the north shore of Massachusetts hunting for sea glass treasure. It's perfect! I get compliments every time I wear it, as it's so unique. My summer wardrobe reflects the colors of the sea. This necklace coordinates with everything! The quality is excellent! Very pretty, not too big. It made the perfect gift!